Ok, I know…this ain’t mod, and it ain’t even a movie. But it is Monday, and it’s my site so just roll with it kids! It has come to my attention that there are still segments of the general population who are not hip to the most famous Cartoon Christmas special ever laid down with ink, A Charlie Brown Christmas Special. Well, if you’ve seen it, it’s now your responsibility to spread the good word. If you haven’t seen it, then read on children and I’ll give you the why’s of why you should, and soon. On October 2, 1950, a young cartoonist named Charles Schultz hit the world with what would become one of the most famous cartoon strips of all time, Peanuts. 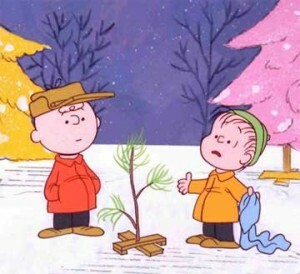 It became so popular that in 1965 CBS broadcast the first of a long series of Peanuts specials, A Charlie Brown Christmas. The basic idea was to take Schultz’s panels and turn them into animation. Easier said than done. They did it on a shoestring budget. They used real children (some who couldn’t read) for the voice-overs. They used cool jazz for the soundtrack at a time when kids were listening to rock. They didn’t have enough dough to finish editing the project correctly, which gives the whole thing a kind of choppy, home-movies feel. And it’s fantastic. I first remember seeing this toon when I was just a little kid, around the age of Charlie and his gang. I kind of remember feeling I was a lot like him. Turns out most kids felt that way at some point or another, which is probably what makes it so successful. Every year we’d wait for shows like this to come on, because if you missed it, that was it. 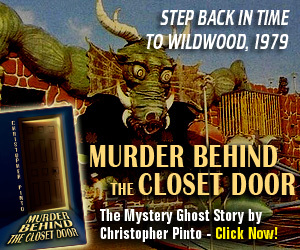 There were no video tapes, no DVDs, no TiVo, and no streaming video. You stayed home that night and watched the show. (No spoilers, don’t worry) The story is about poor ole Charlie Brown, a kid that nothing good ever happens to, and his dog Snoopy, the coolest kid in town. Charlie is depressed about Christmas, because it’s always such a disappointment to him, and because it’s so commercialized. 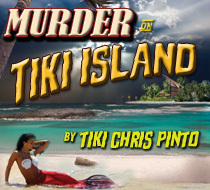 He enlists the help of his ‘friend’ Lucy, who convinces him to direct the school Christmas play. Of course nothing goes the way he wants it to. You’ll just have to watch it to find out what happens. The network execs fully expected it to be a flop. Instead, it became one of the most beloved Christmas stories ever aired, winning an Emmy and Peabody award in the process. 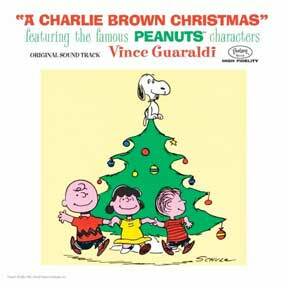 The incredible soundtrack my jazz virtuoso Vince Guaraldi includes the infamous “Linus and Lucy” (aka the Peanuts theme, you know it, you’ve tried to play it every time you were near a piano) plus the most jazziest of versions of “Oh Christmas Tree” ever to come off the keys. The jokes are great, the story is great, and the way it’s drawn, acted and edited makes it feel like you’re in another place, another time watching this classic. By the way…my dog’s name is Snoopy.